Would you believe me if I told you that before getting into blogging and looking at other blogger’s recipes, I had no idea what a whoopie pie was? Well, you should, because it’s the truth. I didn’t even have the slightest clue what in the world a whoopie pie could possible be. And if the name isn’t weird enough, apparently its a PA thing to call them gobs. So I was even more perplexed at what in the world this dessert creation was and why people enjoyed them so much. I’m probably about five years past the point of where these were popular and being blogged as often as donuts (or cronuts now, I guess), but that’s never stopped me from making a recipe before. Since it’s September and the cans of pumpkin puree are calling to me from the shelves and displays at the grocery store I decided that my first foray into whoopie pie making would be of the pumpkin variety. 1 Preheat the oven to 350 Line two large baking sheets with parchment paper. 2. In a large bowl, whisk together the flour, salt, baking soda, baking powder and spices. 3. In another large bowl, whisk together the oil and sugars, then stir in the chilled pumpkin puree. Once combined, whisk in the eggs and vanilla extract. 4. Slowly add in the flour mixture, a little at a time, whisking until fully incorporated before adding more flour. Repeat until all of the flour mixture is gone. 5. Transfer the pumpkin batter to a large pastry bag fitted with a large round tip. Pipe small rounds of the batter, about 2 inches in diameter onto the prepared baking sheets. Alternately, drop rounded spoonfuls of the batter onto the baking sheets and press lightly to reach the 2 inches in diameter. 6. Bake cookies for 10-12 minutes then let cool on the pan for 10 minutes before transferring to wire racks to cool completely. Repeat with remaining pumpkin batter until you have around 64 cookies. 7. Make the filling by combining the butter and cream cheese in the bowl of your stand mixer. Beat on medium speed until smooth then add in the powdered sugar, maple syrup and vanilla and beat on low speed until fully combined. 8. Transfer the filling to a pastry bag filled with a round tip. 9. Pair up the cookies by size. Pipe the filling onto the flat side of one cookie and top with another same-sized cookie. Repeat with remaining cookies. Place cookie sandwiches on a baking sheet and refrigerate for at least 30 minutes before serving. 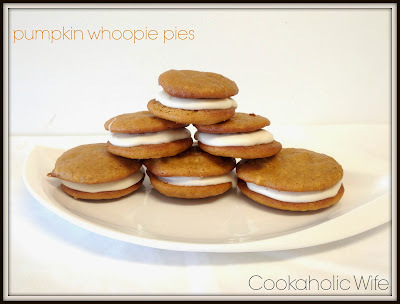 I really should have cut this recipe in half because no one, and I mean one without a party to throw or attend needs to have 30+ pumpkin whoopie pies laying around. I had Tom take some into work and I did as well, but we still had a large container of them here as well. However, they were adorable and tasted delicious. That small amount of maple syrup in the cream cheese really pulled out the pumpkin from the cookies and combined really nicely.